It’s every homeowner or renter’s dream: a big airy utility room, with washing machine, tumble dryer, empty laundry baskets, clothes neatly folded in colour co-ordinated piles... Unfortunately, the reality is that your average laundry room tends to be a much more modest affair. But that doesn’t mean it can’t be efficient, functional and good looking, as our handy laundry room storage solutions show. Planning a utility room? Find out how in our guide. 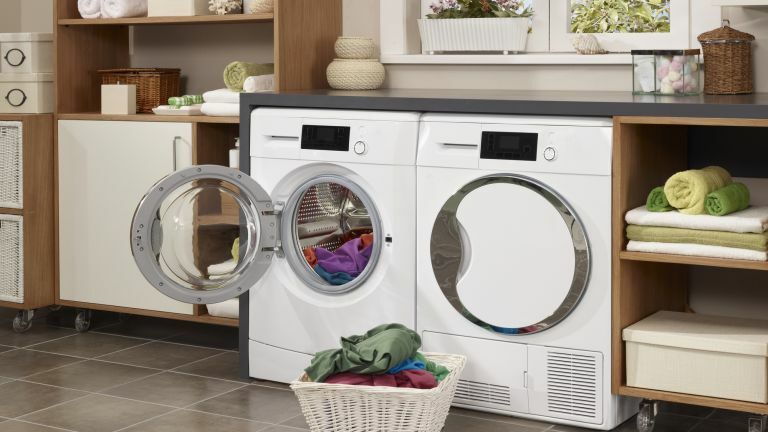 And don't miss our buyer's guides to the best washing machines and tumble dryers to find the perfect model for you. Find more storage ideas on our dedicated hub page, too. Before going crazy investing in storage for your laundry room take a step back and assess the current layout of the room. Could you switch it up to make more space? A good start is to look at where your washing machine and tumble dryer are positioned – if you currently store them side by side, think about getting a cabinet that can stack them. Alternatively a stacking kit enables you to install a tumble dryer on top of your washing machine without any additional fixings. Room designed by Neptune. Find more for small utility room ideas to get inspiration for a tight space. Invest in functional, open shelving so you can keep everything in sight and easily accessible. Deep shelves lower down will be handy for heavier items, with shelves above head height designed to stash items you don't use often. Even better, opt for a modular storage system like Ikea’s Algot system that can be customised and quickly adapted to different needs and spaces. Find more utility room design ideas in our guide. Struggle to find space to dry your loads? Instead of desperately draping everything over your shower door, try a wall mounted drying rack that extends to meet your laundry needs and then folds away when not in use. This clothes dryer from Garden Trading also has a shelf on top for storing washing powder and wooden hooks for homeless hangers. For more drying tips, check out our clever laundry hacks. All it takes is a single red sock to slip through and your white load comes out looking like Baby Spice’s wardrobe. Never again mourn the loss of your favourite clothes by getting yourself a laundry basket that clearly divides you lights and darks. There are plenty of options out there and you can even fashion something yourself, but we love the vintage look of this rattan hamper from Garden Trading. A laundry room might be one of the most hardworking areas of your home but that shouldn’t mean it can’t be beautiful. If you have the room and the budget, investing in built in storage that would work perfectly in your space will allow you to use every inch efficiently. Schüller offer loads of beautiful storage options that have been designed specifically for utility rooms. Another great way to avoid using up precious square footage with bulky floor standing drying racks is a wall mounted, fold away airer. Place this rack from Pulley Maid above a radiator and you have an instant practical drying space that would work in even the most restrictive of spaces. Let’s face facts, washers and dryers are never going to be aesthetically pleasing. So cover up those eyesores really inexpensively with some makeshift curtains. You can choose a pattern that suits your space and attach it to some net wire, keeping your bulky appliances out of sight, out of mind. Just the way we like it. Don’t overlook the backs of doors, they can be a great place for storing smaller items, such as brushes and washing powder in baskets. This door rack from Elfa is made up of a combination of different sized wire baskets, ideal for storing bottles of laundry detergent, fabric softener, pegs or hand towels. Top tip: The back of the door is also a great place for storing the ironing board - get a wall mounted holder or fix on some ordinary coat hooks. Increase efficiency by installing a space for folding and organising your laundry. This will save you having to lug all your clean washing to the nearest available clear surface. It needn’t be a huge space, a countertop spanning a washer or dryer would work perfectly. If you are really strapped for space, fix a fold down table or shelf to the wall. The space between your washer and dryer is always an awkward one and is usually just reserved for dust and odd socks. Put it to good use a storage solution that fits the space. This narrow cart from House of Bath that is just big enough to provide storage for all your laundry room essentials, and it's on wheels, so you can reach everything when you need to. Sorry did we say hide? We meant organise. Large baskets are great for taming clean washing that’s waiting to find a home or for storing your stock pile of laundry detergent. They also are really aesthetically pleasing and no one needs know that they are actually often filled with an unruly mess. These wicker or rattan baskets are part of a room designed by Neptune. No space for a separate utility room but bags of room in the bathroom to squeeze in a laundry zone? Keep yours neat with a sizeable cupboard to hideaway folded laundry, washing powder and coat hangers, and use the space above the washing machine for a neat drying rack.